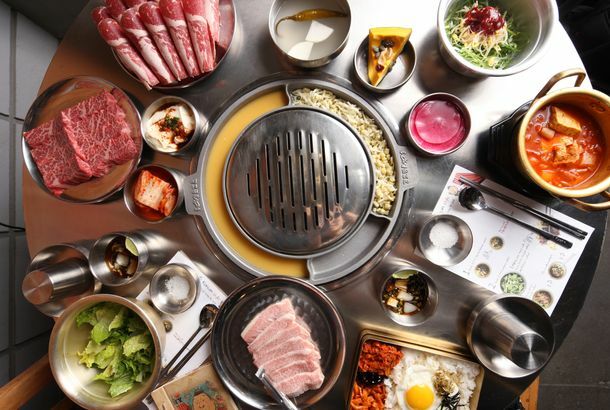 The Absolute Best Korean Barbecue in New YorkAffordable booze, high-quality meat, and superlative banchan await you at these four exemplary spots. Food & Wine ‘Best New Chef’ Alums Cooking at Paiche; Tam O’ShanterThe Atwater Village Scottish restaurant serves roughly 5,000 pints every March 17. Guelaguetza Gets InkedTonight the city’s seminal Oaxacan restaurant will hold a party showing more work from Colectivo LaPiztola. Lock & Key Bringing Twenties Vibe and Craft Cocktails To KTown, Opening FebruaryThe bar is attached to new Stall 239, which serves street food and deep fried peanut butter and jelly sandwiches. King Hot Dog Opens in Former Location of Puppy MillAfter rebuilding a pet shop into a restaurant for a year, Hot Dog King begins serving in Koreatown. Farid Zadi Parts Ways With Spanish Fly GastropubThe chef is starting up on online cooking school, with plans for a possible pop-up. Farid Zadi Reboots Ecole de Cuisine at Spanish FlyKoreatown’s Spanish Fly Will Be the Home of Chef Farid Zadi’s New Tutorial fforts. Roy Choi Lending a Hand to The Line HotelThe Koreatown property comes from the owners of New York’s The Nomad. Spanish Fly Holding CommuniTEA Bakesale for Victims of Hurricane Sandy, Saturday100% of all proceeds go to American Red Cross Disaster Relief. Farid Zadi and Susan Park Opening Spanish Fly Gastropub, Saturday in KTownHe designed the lunch and dinner menu, while she’ll be making the sausages. Beer Belly Presents ‘Gone, But Not Foiegotten,’ June 30 in KTownChef Wes Leiberher might be the Shakespeare of questionable foie gras wordplay. Gatten Sushi Opening Sixth Store, Coming to KoreatownAll sushi is just two-dollars at this Irvine-based chain. Beer Belly Starts New Order Mondays and Hoppy HourThe beer bar also serves a “hoppy meal” combo, with jidori wings, but no toy. Torayoshi Ramen Bringing Tonkotsu to KTown PlazaThe opening of this Tokyo-style spot is expected sometime next week. The Big Lebrewski Hits Beer Belly on FridayItems include “You’re Entering a World of Pain” hot wings and pancakes with white russian cream. The Park’s Finest Joins Beer Belly This SundayThe local Filipino-American barbecue caterers will raise funds for their first restaurant space.